We are a small breeder in Northwest Kansas that raise one or two litters a year striving to produce quality not quantity. Whether you are looking for an outstanding hunting dog, faithful companion or just a family pet, HUNT IT UP LABS can provide it! 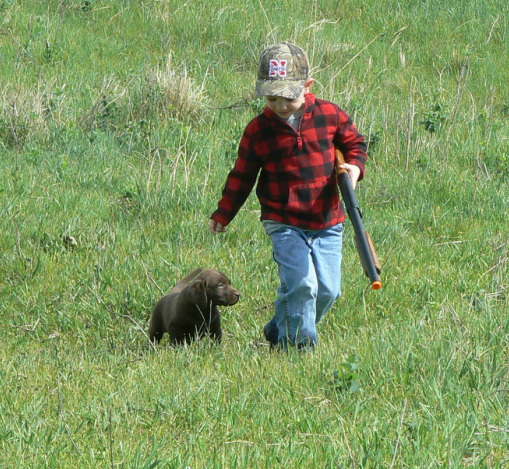 Our goal is to produce quality labradors from generations of proven hunters. Whelping a litter of pups is an exciting time at our house. It's eight weeks of fun watching them grow with lots of help from the grand-kids. Our puppies get plenty of attention and are very well socialized thanks to them! We spend many weekends traveling to HRC Hunt Tests in the spring and summer where we've met some really good friends. We don't always come home with a pass or title but it's back to training the next week so we can go again! Our labs are family pets, not breeding stock. They live to hunt and retrieve anything. When they hear "HUNT IT UP" they're on it, whether it's a pheasant, quail, turtledove or retrieving their supper bowl! Check out our facebook page (HUNT It UP LABS) for more pictures and videos.